Five hundred replica Air Jordan V sneakers line the walls of Kith's new Miami outpost, designed by New York studio Snarkitecture. The opening of the streetwear brand's new store coincided with this Design Miami, and marks Kith's first permanent presence outside of New York. Once again, Kith founder Ronnie Fieg tasked Daniel Arsham and Alex Mustonen of Snarkitecture with the interior design. The new space, similar to the New York store designed by the duo, features a wall filled with cast replicas of Nike's Air Jordan V sneakers. Air Jordan V sneakers, designed by Tinker Hatfield in 1990, were the fifth iteration of the original Air Jordans. Snarkitecture used them to signify that this is the fifth Kith store. "Miami has always been like a second home to me, and it's been an important step I've wanted the brand to take since our first pop-up there in 2013," said Fieg. "This will be our most elevated store design to date, and I believe that we have something to offer the Miami customer that no other retailer can." Throughout the rest of the store, which the brand describes as "gallery-like", terrazzo panels cover the floors and form a gradient of white to blue. 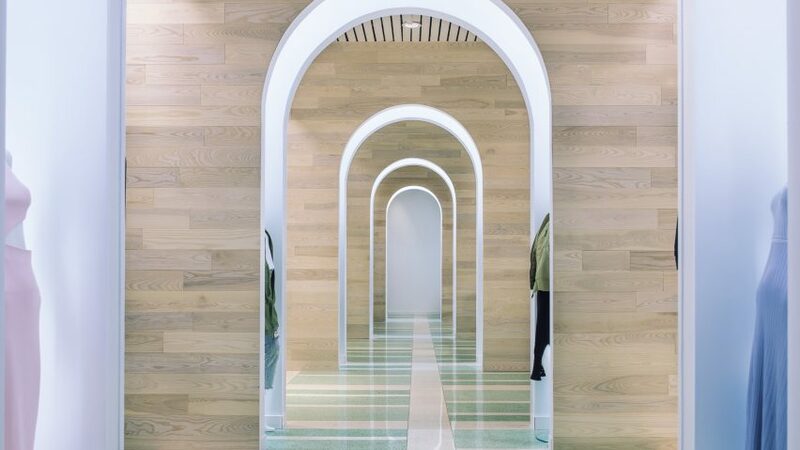 A series of arches organise the space, and clothes, accessories and footwear are presented within alcoves, metal shelving units and glossy white display cases. To coincide with Art Basel, Kith commissioned artist Futura to create a piece for the window display – which he based on a pair of trainers the brand has designed alongside Nike. Snarkitecture also designed a pop-up shop in LA for European fashion brand COS, which featured rows of steel sheets with garment-shaped cutaways. The Brooklyn-based studio also transformed the grand hall of the National Building Museum in Washington DC into an all-white "beach" by filling it with a sea of translucent balls and customised a private jet using a blue ombre finish.